I love a good sequel almost as much as Connie loves another bowl of cereal! So here I am, to shed the light, once again, on those golden cereals (not Grahams) of yesteryear. I have seen I am not the only one to harbors strong feelings for the cereals of the past. Why is this? Why are there so many people and websites that catalog their retro-cereal habits? Is it because the nectar of time and childhoods long ago have only made those crunchy, sugary cereals even sweeter? Is it the cute little cartoon mascots and the bright colorful boxes art that captured our imagination? Could it be fond remembrances of the thrill of the chase to get a few glow-in-the-dark stickers or a sticky wall-crawling toy that has kept us longing for what we can no longer have? Or do we just refuse to accept change and step aside for a younger generation of cereals to rise to prominence? Debate amongst yourselves. But, I do know this–a decade where there was a purple, blue, orange, and green colored smiley-face cereal with pink marshmallow stars is a decade I am proud to have been a part of. I don’t think I ever ate these, but I do remember the box and the name, and these didn’t last too long. But take a look at that box! The sheer magiciousness of it all! It seems like a really fun cereal. That’s a genie that enjoys his work of sprinkling stars that strangely have holes in the middle of them. This cereal reminds me of Christmas sugar cookies with those little candy balls sprinkled on top, so by association, it can’t be bad… right? Oh man, Hidden Treasures are a hidden gem! 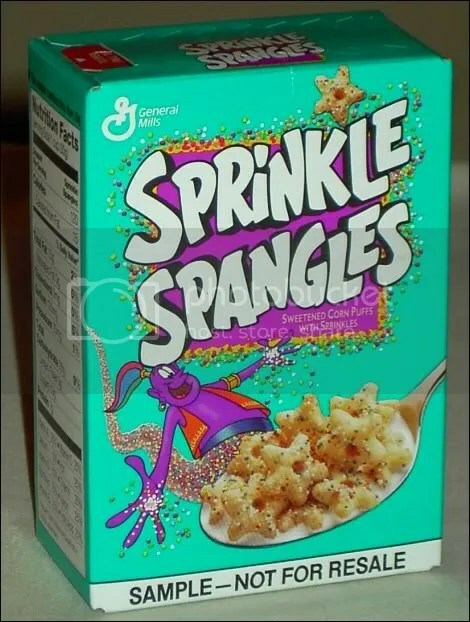 This was an early 90s cereal that never got it’s due respect. The outside (again) was similar to Cap’n Crunch, but the inside… the inside, my friends, was a crunchy strawberry delight. 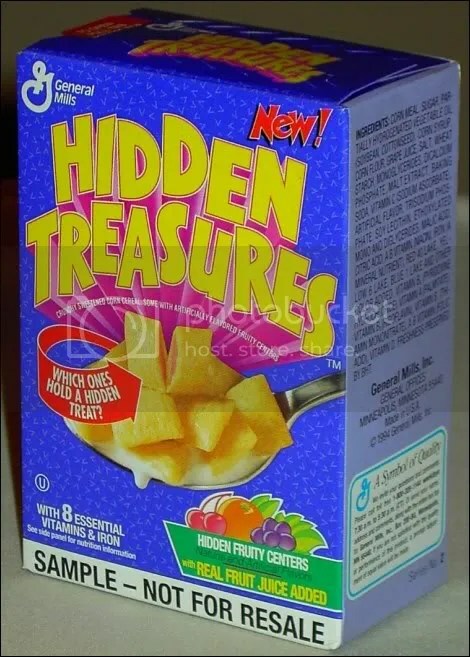 The box claims “hidden fruity centers”, but really, they weren’t hidden because even though every cereal piece didn’t have the “fruity” center, we knew one was coming along sooner than later and we always knew where it was going to be as well. As for the “fruity” center part, I remember it being more like a strawberry flavor each and every time at bat. Although the years haven’t been kind to my memory, so maybe they truly were cherry, orange, or grape flavored. Which would totally change my opinion on this cereal. Ah, another favorite from my childhood. And another cereal that seemed to come and go all too quickly. This cereal came in two flavors: vanilla and chocolate. Ice Cream Jones was the mascot and promised to deliver “the great taste of ice creams cones!” Mr. Jones, you came closer than any man before or since ever did. This is another one of my vague recollections from the 80s. 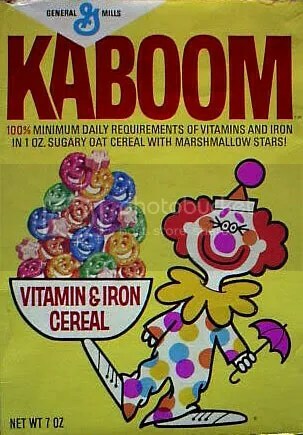 Kaboom was most popular during that very decade in addition to the 70s, but is still produced today by General Mills today. Except you have to buy it online. Like at Amazon.com. For $17. What the heck?! The cereal bits here are bright colored sweetened smiley faces with a splash of marshmallows. This is another one of those very fun looking cereals, something I’d probably even pick up today if it was on the shelf. Yes! A Real American Cereal! You know, the action/adventure cartoons were really an untapped market for cereals. 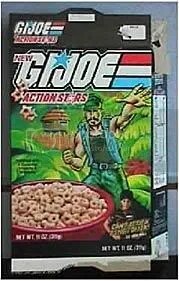 It’s great to have GI Joe here, but you’d think at some point someone (more than likely Ralston) would’ve put together cereals based on Transformers, He-Man, Thundercats (Lion-Os, get it? ), and M.A.S.K. ‘Action Stars’ was represented by a variety of Joes, just depends on what box ya got. Upon closer inspection, I realize this cereal really does have “action stars” for the cereal bits and they look surprisingly similar to the Sprinkle Spangle stars. No marshmallows to be found here, no fruity flavors, just a pure sweet crunch of oats and grain. Think Lucky Charms without the charms. But that’s the way we liked it when we were out in the killing fields battling Cobra and destroying their ludicrous and illogical plans to conquer the world! 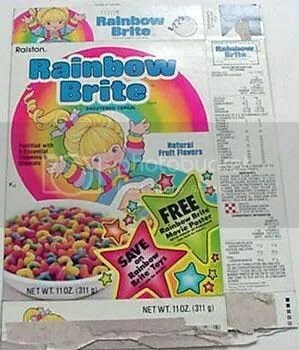 I only posted this one for the ladies; I wouldn’t be caught dead eating Rainbow Brite cereal! Especially considering that it’s nothing more than a Trix ripoff with its “fruit flavored colorful bites”. And as far as cereals go, imitators are NEVER as good as the originators. How the importance of this cereal snuck by me when I was younger, I’ll never know. This was a few years after Ralston’s Ninja Turtle cereal but is essentially the same except it’s not Spider-Man themed. The regular Chex squares are no longer creatively called “Ninja Nets” but are now “Spider-Webs”. I don’t know what happened, because this was a second chance for me to load up on the awesome Chex/marshmallow combination. But I don’t remember eating or buying this nearly as much as the Turtles version a few years earlier. Maybe it’s because I was older and this was based on the FOX Kids Spidey cartoon, which was a show I could never get into even though I love Spider-Man and was still well within that show’s target demo. Oh well. I don’t even think Ralston is around anymore, but like I said, I still have my Lucky Charms/Chex project, but still, it would be nice if someone got on the ball and produced a cereal similar to this again. 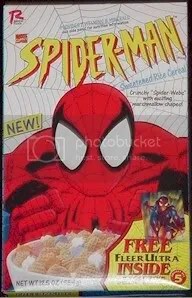 Wow, never knew this cereal existed either and it’s another one I would’ve never cared for as I didn’t like the movies. Though, at least Ralston took a chance and mixed things up a bit with cinnamon bits of cereal and marshmallows. Haven’t seen that one before. This cereal is most notable for probably the only likeness of George Carlin to ever appear on a cereal box. I should’ve just called this ‘The Many Cereals of Ralston’. This one is a fairly simple and quite tasty attempt to cash in on the popularity of Matchbox back in the day and I’m pretty sure it’s been around on and off ever since. The “wheels” here are pretty much like Honeycombs, plus marshmallows. I remember eating this one A LOT. Again, they were going to ‘Trix’ here, but the shapes are fun and that’s really all that matters. Every boy goes through his dinosaur phase, although I find the theme of the dinosaurs and diners to be a bit forced all in the name of a lame play on words. Ralston, those ingenious SOBs, came up with the amazing idea that people wanted to read comic strips while eating cereal! This was truly revolutionary thinking. So they decided to just slap a few strips on the box and be done with it. There were nine different versions of the box, and if you REALLY loved this cereal and you were a fast eater, you probably got really bored with all nine pretty fast. Ralston brought a respectable line up to the boxes: Family Circus, Beetle Bailey, Marvin (One of the all-time greats! ), Dennis the Menace, Hi and Lois, Hagar the Horrible, and Popeye. But I’m pretty sure all these characters were owned by the same syndicate company. Yes, most of these strips have been around forever and are classics, but they aren’t heavy hitters. You needed Garfield, Peanuts, Calvin & Hobbes, Farside, etc. to really make this thing fly off the shelves! 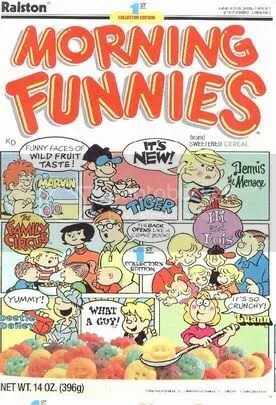 In 1988, the people just weren’t ready to read the funny pages while eating cereal. And they still aren’t. Want more Cereals From Beyond? Check out Part 1 and Part 3 and Part 4 and Part 5! I used to eat Hidden Treasures everyday I woke up lol one of the best ever!!!! Would be awesome I general mills decided to give it another try. Oh and I also remember another one of my favorites that stands out to this day around the same time was Pepsi Clear. That lasted maybe 2 years and disappeared. Clearly Canadian waters were another fav of mine. GEEZ I can feel the sugar rush from here! Crispy Critters, Kaboom, Dinky Donuts, I went thru all of those. Wasn’t there one with some monster mascots called Freakies, I think? I’ll have to dig info on that up. I remember having the magnets. You forgot KRUMBLES by Kellogg. They had a GREAT cookie receipe using that cereal, and I’ve missed it for years! Hmm… Haven’t heard of that one before. Possible inclusion for a future entry! hidden treasures were disgusting. the fruit flavored filling inside was utterly vile. It was like they boiled strawberries and then let it sit out uncovered for a week to let it harden. Plus, an assload of extra sugar…. Before Hidden Treasures,there was a similar cereal circa 1976-’77 that had chocolate or vanilla FROSTING in the middles! It tasted as good as it sounds. That was the last straw for activist mothers against sugar in cereals.